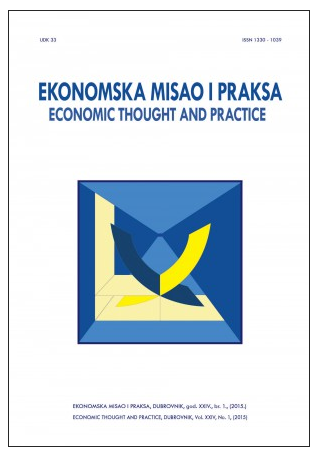 Economic Thought and Practice is scientific journal published by the University of Dubrovnik. It encourages high quality submissions on a broad range of topics in the field of economic including theoretical, applied, interdisciplinary and methodological work. The submissions are welcomed, but not only, on the issues of producer and consumer behaviour, regional and industrial economics, tourism, financial markets, unemployment, inflation, globalisation and international economic integration, institutional economics, economic policy, development and growth, history of economic thought and other fields of economy. All papers are subject to a «double-blind» review process, detailed in the Guide for Authors. Besides research articles the journal also publishes a variety of other types of papers such as book reviews, occasional discussion papers on important topical issues and conference summaries. The journal supports open access to the published papers. It is co-financed by the Ministry of Science and Education of the Republic of Croatia. The journal is published twice a year (June and December). The papers must be submitted no later than March 31st for publication in the June issue, and by September 30th for publication in the December issue.